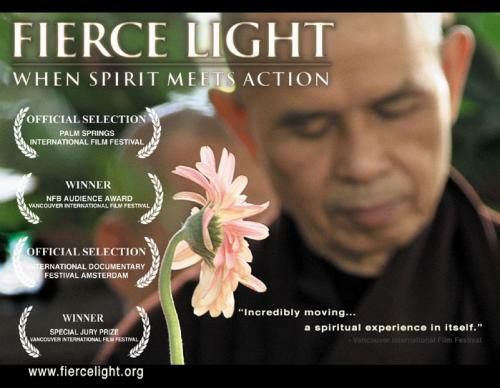 ‘Another world is possible’ – a short sentence rich in meaning which acted as the catalyst for filmmaker Velcrow Ripper to produce another tremendous documentary – Fierce Light: When Spirit Meets Action. Ripper’s inspirational journey is absorbingly thought-provoking as it explores with magnificent skill what Gandhi famously termed ‘soul force’. The backbone of the film is provided by the interviews Ripper conducts with the spiritual giants Archbishop Desmond Tutu and Thich Nhat Hanh; it is against this backdrop that the activism of individuals such as Alice Walker, Julia Butterfly Hill and Darryl Hannah can be properly understood. At the outset of the film, Congressman John Lewis sets the scene, encapsulating the entire philosophy of non-violent resistance when he said of his own spiritual awakening, that he just ‘decided to get in the way, to be maladjusted.’ If it was not for such awkward and non-conformist behaviour, the civil rights movement in the USA would have been irrelevant and the tyranny of injustice would surely have persisted. If Jesus had simply towed the line, then Christianity would not even be a footnote in the history of world religions. If Gandhi had conformed to the status quo and eschewed social activism he would have sunk into obscurity along with his quest for human rights and democracy. As a Christian, I cannot separate spirituality from activism as to do so, in my opinion, would be an abrogation of Jesus’ call to follow him in word and deed. An anaemic faith that consists of a lazy assent to a number of doctrinal suppositions is a dead faith; a vibrant faith on the other hand, consists of confronting injustice and living an activist lifestyle. Ripper’s film is a compelling call to action; it is inspirational and forces us to look within and without ourselves, regardless of our religious affiliation, and embrace the concept of non-violent activism. The cinematography, as one would expect from a Velcrow Ripper film, is powerfully evocative and adds immensely to the appeal of the film. Watching the film, which I have done now on a number of occasions, is a spiritual experience in itself. Another world is indeed possible, but only if we all ‘decide to get in the way’ and refuse to remain passive amidst injustice, violence and hatred.